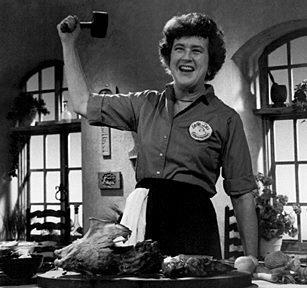 Yesterday marked Julia Child's 100th birthday! So - to the old doll, a very happy birthday and a boooooon apetit! Julia Child is a culinary legend, cookbook writer and TV show host. She is best known for bringing French cuisine and cooking to the American people, making it accessible to make it her "Mastering the Art of French Cooking." For those of you who have seen Julie/Julia (the film), you will have gained a brief glimpse of the true culinary star that she was! Julia was FEARLESS in the kitchen, and just a delight to watch as she so effortless cooked her way through hundreds of recipes. Which in turn gave one complete adoration for the kitchen and cooking. Happy Birthday Julia, 100 years later and you are still inspiring cooks everywhere! 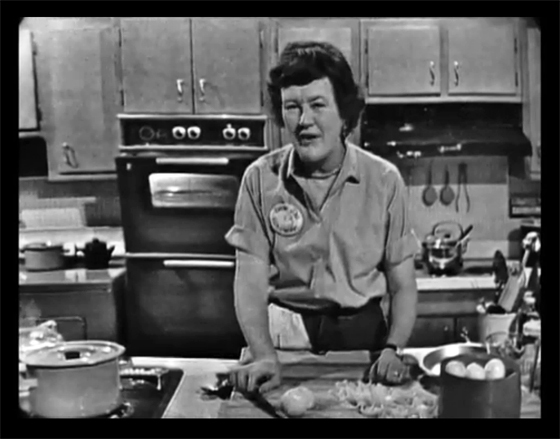 I am going to share with you two videos I love of Julia Child. The first, is her first episode of The French Chef, where she makes Boeuf Bourginon. A classic French beef stew, that Julia has been made famous for cooking! The second is a quick clip of Julia introducing different types of chicken, in her comical & charming self.